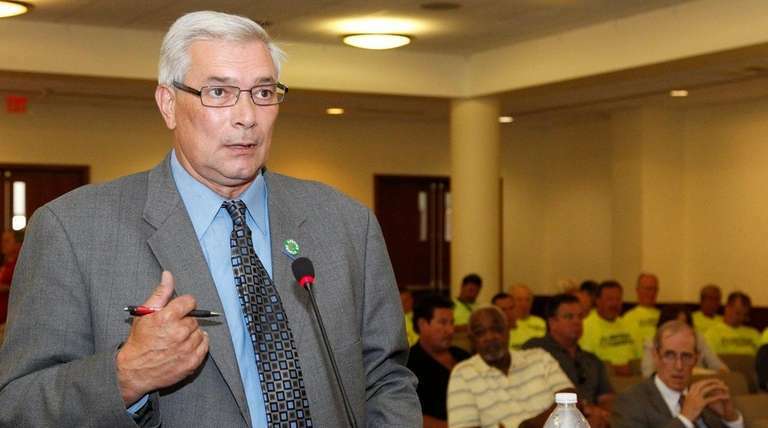 Nassau County failed to properly calculate the overtime for at least 15 Civil Service Employees Association members dating to 2012, costing the employees thousands of dollars in unpaid compensation, according to a new federal lawsuit. The suit, filed Dec. 14 in the Eastern District of New York, contends that Nassau violated the federal Fair Labor Standards Act by not including longevity payments, shift differential and hazard pay in CSEA members’ regular rate of pay before calculating their overtime. The perks, which are in addition to an employee’s base salary, were paid after the overtime was calculated, the suit alleges. The union alleges that the county’s failure to properly pay its members also resulted in reduced pension payments. While the suit includes only 15 plaintiffs, CSEA President Jerry Laricchiuta said the case is expected to grow in the coming months to as many as 3,000 union members eligible to collect overtime — bringing the cash-strapped county’s potential liability into the millions. The suit seeks back pay and pension contributions for each plaintiff, ranging from $16,220 for a civilian Police Department 911 operator with 24 years experience to $300 for a 911 operator with 16 years on the job. The plaintiffs also include 911 supervisors, cooks and kitchen supervisors at the county’s jail in East Meadow, and a sewage treatment plant operator with the county’s Department of Public Works. Jostyn Hernandez, spokesman for Nassau Comptroller George Maragos, said overtime is calculated by the county’s Human Resources and Information Technology departments. The union says the 1938 Fair Labor Standards Act requires that “non-discretionary bonuses” be included in an employee’s regular base pay before calculating overtime. Shift differentials are additional payments made for working overnight hours; longevity pay is based on an employee’s seniority and hazard pay is for civilian employees working in dangerous conditions such as the jail. Shift differential payments are made bi-weekly in an employee’s regular paycheck, while longevity and hazard pay are lump-sum payments. Union officials said federal law stipulates that the one-time payments should be prorated throughout the year to fairly calculate overtime. Nassau employees get paid one-and-a-half times their regular pay for every hour in excess of 40 hours worked per week. CSEA 911 Operators Unit President Gary Volpe, who is not a plaintiff in the case, said he discovered the overtime error in 2010 and filed a grievance with the county. The grievance, he said, was denied the following year. “The county was aware of this violation since that time and did nothing to correct the violation,” Volpe said. While the overtime underpayments date back decades, county employees are eligible under federal law to collect back pay dating back only three years, Volpe said. Police Benevolent Association President James Carver said longevity pay and shift differential are included in his members’ base pay before determining overtime. Police officers are not eligible for hazard pay.